Police are pursuing a forensic connection between the death of Morgan Harrington and an unsolved sexual assault in Fairfax. Virginia State Police may have the break they need in the case of Morgan Harrington. State and local investigators are pursuing a forensic connection between the disappearance and death of Harrington and an unsolved 2005 abduction and sexual assault in the city of Fairfax. The connection was made through DNA evidence. Exactly what that evidence is, and whether it was found on Morgan&apos;s shirt or the crime scene at Anchorage Farm, is not being released. Now, there is a composite sketch of the suspect connected to both crimes. The black and white sketch seen below may be a critical link to finding who killed Morgan Harrington. The suspect is described as a black male, 25-35 years of age and approximately 6&apos; 0&apos;&apos; with a medium build, black hair and a mustache. Thursday, Virginia State Police confirmed that there is a forensic connection between the death of the 20-year-old Virginia Tech student and a sexual assault in Fairfax City. 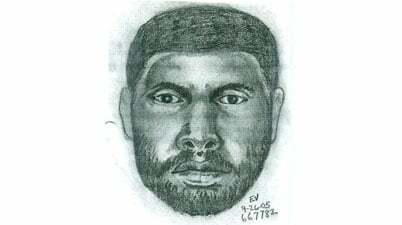 That crime happened in September 2005 near townhouses on Rock Garden Drive off Jermantown Road. "We know for sure, based on lab requests and lab analysis, that in fact whatever happened in 2005 to the victim, the same person had contact with Morgan," stated Virginia State Police Lt. Joe Rader. The Harringtons are confident that the DNA link will lead them to who murdered their daughter. "I think this is a huge step," said Morgan&apos;s father, Dan Harrington. "We&apos;ve been saying this for the last eight months; someone does not have an initial crime of murder." Morgan disappeared last October following a concert at the John Paul Jones Arena on the campus of the University of Virginia. Her remains were found in late January on the 700 acre Anchorage Farm in southern Albemarle County. "Who is this person and who are they so connected to Charlottesville that they know Anchorage Farm?" asked Dan Harrington. But that is not the only question the Harrington&apos;s have at this point; they are also still questioning why it took state police so long to release the information. The Harringtons say they were in-the-know weeks ago. Such was the case with Morgan&apos;s Pantera t-shirt; found last November on 15th Street in Charlottesville, but not told to the public until April. "We&apos;ve been really trying to increase our pressure on the police so that the information would be released," said Morgan&apos;s mother Gil Harrington. "There are reasons why we aren&apos;t as maybe as forth coming as immediately as possible with information," said Virginia State Police Spokesperson Corinne Geller. No matter the case, the Harringtons are hopeful the new information will lead to new tips and bring about justice for their daughter. "It gives more information for people to be screening out suspicious behavior or people to make the hairs on your neck go up," said Gil Harrington. There is a $150,000 reward for information on the Harrington case. Those with information about the man in the sketch may contact Fairfax Police Detective Mike Boone at 703-385-7959. Anyone with information about the Harrington case should call the Jefferson Area Crime Stoppers at 434-977-400 or Virginia State Police at 434-352-3467.